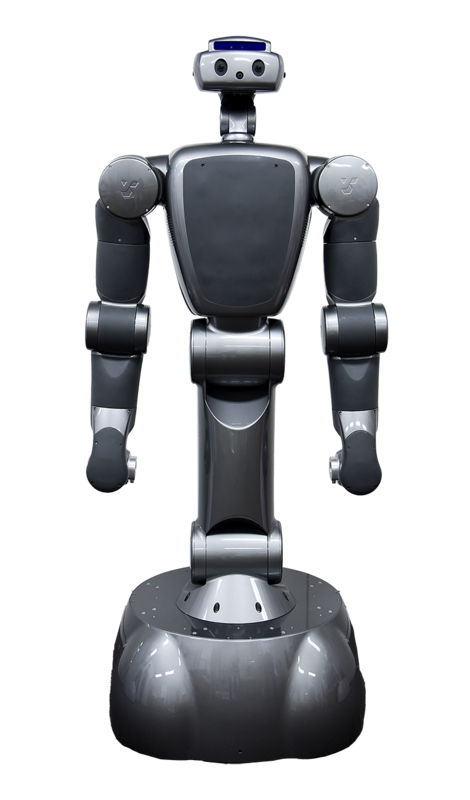 Torobo is a humanoid research platform developed to accelerate our clients' robotics research. Torobo is an upper torso humanoid, which has 6 joints for each arm, 2 joints for the waist, and 2 joints for the neck. It can have a wide task space by bending its waist. Torobo is designed to have similar body size to humans. It can be used for the research of applying a robot to the human's living space, and the research of a robot working in a production line instead of workers. Because Torobo has torque sensors in all the joints and can control its joint torque directly, it can be used for the applied research of force control and impedance control in conjunction with machine learning, such as assembling, cooking, and physical interaction with humans. Torobo is compatible with ROS. You can control both the actual robot and the simulated one in Gazebo (ROS simulator) using the same program. In addition, functions of trajectory planning and self-collision detection are implemented with MoveIt! by default. Torobo is easy to carry because the robot and the controller are small. It can be driven by a battery because it's power supply is DC 24 V. You can use Torobo as a mobile humanoid by mounting it with a cart or an AGV. The robot controller has a built-in PC (Ubuntu), in which ROS is installed. You can control the robot by connecting a mouse/keyboard and a display to it and launching the ROS. As for the power supply, you need to prepare a switching power supply (24V DC) used in conjunction with a shunt regulator, or a stabilizing power supply that can allow the load-side voltage fluctuation at a certain level. The size is W:920mm, H:800mm, and D:1000mm. Because we provide the drawing of the bottom of robot, you can prepare a base by yourself. This is a slide-open type gripper. Because it uses the internal bus, you don't need to worry about cabling. You can change its fingers according to your application. Noitom's Perception Neuron® (a motion capture system) is used to control the robot. You can use this system for remote control and gathering the training data for machine learning. It has safety functions such as avoiding singularity and self-collision, and torque limit when the robot is physically constrained (e.g. pushing the desk from above). It also has the activate/deactivate function for each of right/left arms, grippers, neck, and waist. During the movement shown in this video, you can obtain the joints' angle/velocity/torque/current data and camera image. © Tokyo Robotics Inc. All rights reserved.